During a meeting in Sarajevo with a delegation of the Political and Security Committee of the Council of the European Union, Republika Srpska President Zeljka Cvijanovic said that only candidate status can keep European integration process active in BiH. “I was asked why I think we deserved it. I said because I know very well when and at what stage some others gained the candidate status and what assessments they received in terms of agriculture, public administration and especially the judiciary. I see we are at the same level as those when candidate status was granted to them,” Cvijanovic told reporters after the meeting. 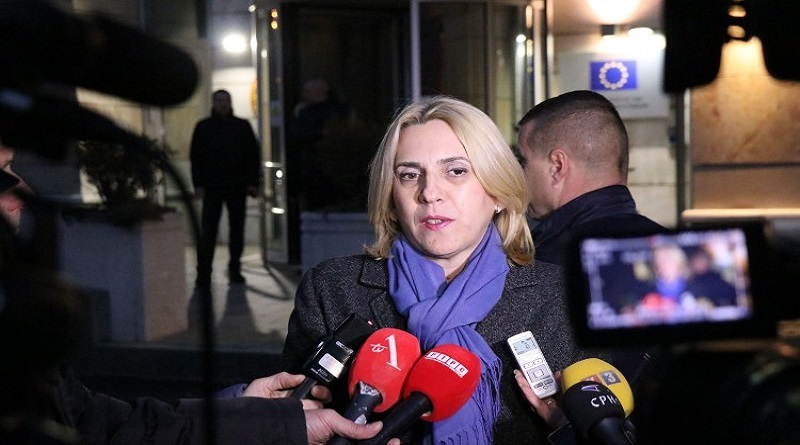 She has stressed that there should be no waste of time on topics that are unattainable and that it is better to nourish coordination mechanism and that every level of government is doing its part of the job instead of imagining how something will once be transferred to the level of BiH. Cvijanovic has stressed that EU delegation informed that when it comes to forming the government after the elections, the work has been more or less completed in Republika Srpska, and that it is the turn of the partners from the Federation of BiH to do the same. “We have an interest in establishing institutions as soon as possible, i.e. constituting the power at BiH level. I reiterated the determination of Republika Srpska to work devotedly on the European path, and we have already proved that. I expressed my satisfaction with our Reform Agenda and the fact that in the previous term of office, we achieved some record indicators resulting from the agreement and implementation of this agenda agreed with the EU,” Cvijanovic has said. She has pointed out that the best indicators regarding the employment were achieved, and that together with FBiH Prime Minister Fadil Novalic, she informed the delegation on plans for future programmes that should prevent young people from leaving BiH. “I am interested in continuing good practices in Republika Srpska,” said Cvijanovic. She has pointed out that the EU delegation said that Republika Srpska was often in a focus and was falsely accused, recalling the stories of paramilitary formations, militarization, which were planetary news fabricated, among other things, in Sarajevo by certain agencies and internationals. Cvijanovic has said that the security situation, migration issue and terrorism were also discussed in the meeting and that she told her interlocutors that she was not satisfied with the communications between the different levels of government regarding the exchange of certain information related to potential threats. She has pointed out that Republika Srpska is not satisfied with what is happening when it comes to the migration crisis, fearing that BiH might become a collective centre and that the issue cannot be treated in such manner. “We expect clear messages from the EU and we will take the course accordingly,” the president of Republika Srpska has said. She has pointed out that the EU is interesting for migrants in terms of its borders being opened, but that BiH should take care of preserving its own borders in terms of controlling migration and preventing illegal entry into the country. Cvijanovic has noted that during the meeting the focus was on political and security issues, the results been achieved so far in terms of fiscal consolidation, economic trends, social sphere, with a special emphasis on youth.